Upgrade your GM 2003 and up stereo to Sirius radio with the new Sirius Connect. 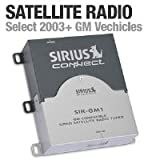 This package includes everything that's necessary for you to play SIRIUS through your compatible factory stereo: a SIRIUS radio, a roof-mount antenna, and the adapter cable that connects the radio to your stereo. You can mount the compact radio easily in a convenient spot behind the dash. The adapter cable hooks up to the radio at one end, and to your factory stereo at the other, providing all signal and power connections. The magnetic antenna mounts firmly on your vehicle's roof, and connects to the satellite radio. An extra connection lets you keep a factory (or factory-compatible) CD changer connected to the system.